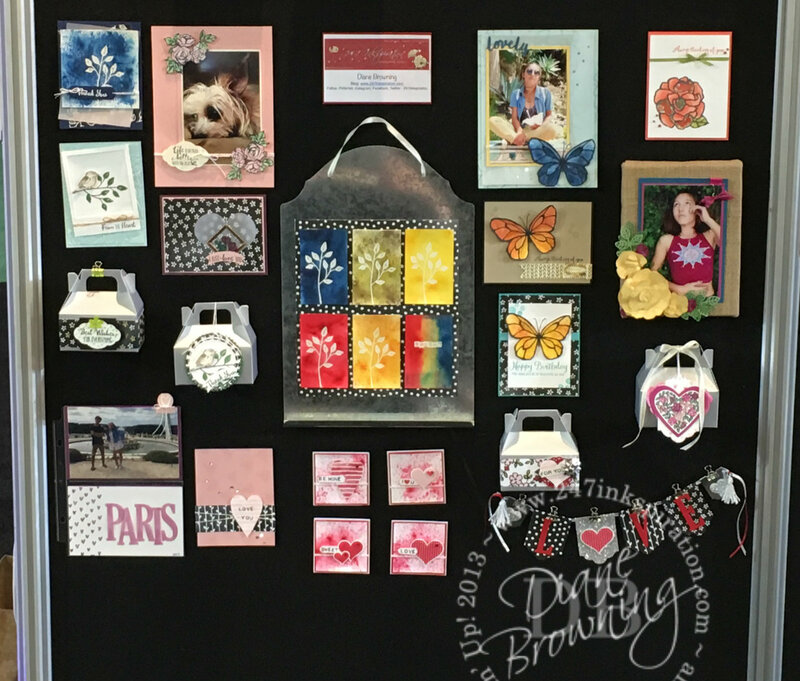 Last month, I traveled to Salt Lake City for Stampin’ Up’s OnStage Event. OnStage is the new name for our Demonstrator Convention. These events are always so much fun. This time, it was just Lyndi and I going. Unfortunately, Margo had a pup emergency at home and had to cancel at the last minute. We really missed having her along. We usually fly in the day before so we have a chance to get settled before all the craziness starts. 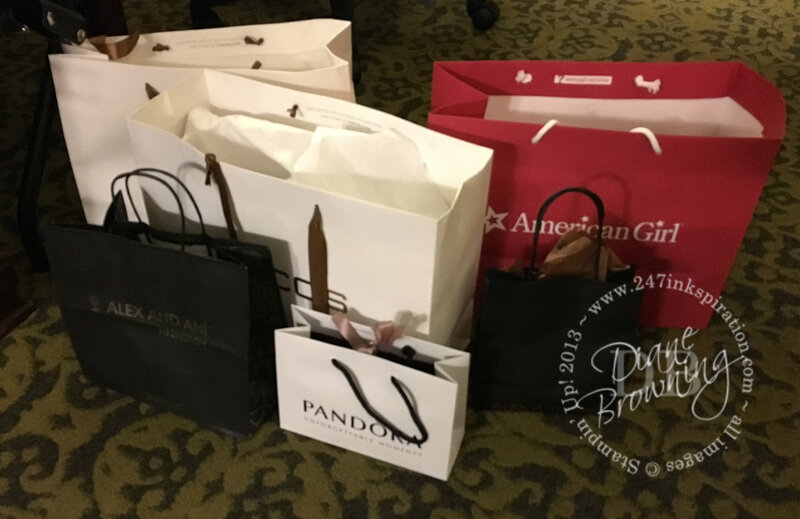 And this gives us a little bit of time to do some shopping too. 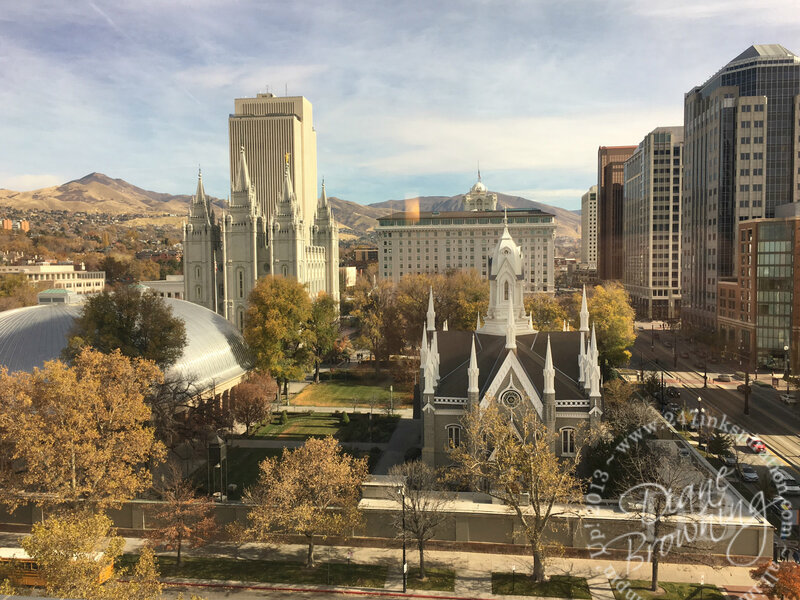 This year we tried a new hotel, which happened to be right across the street from Temple Square. We had a pretty good view of the Square from our floor. Thursday morning, I went over to the Convention Center early to set up my displays. I was thrilled to be selected to be a Display Stamper again. It is such an honor to be trusted to work with brand new goodies that no other Demonstrators have seen yet. And this year, I got a brand new product, Brusho, to play with. 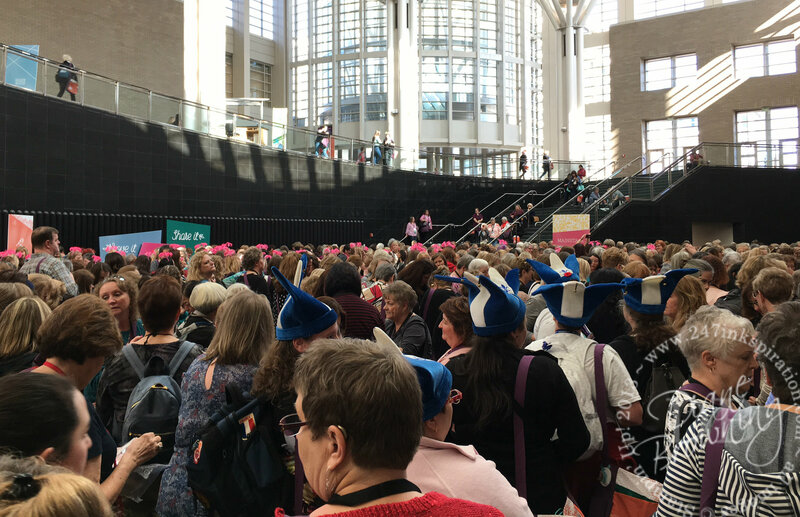 Do you ever wonder what it looks like when you have 2800 people in line for a Stampin Up Convention? No lines here. It is just a crazy mob of people. 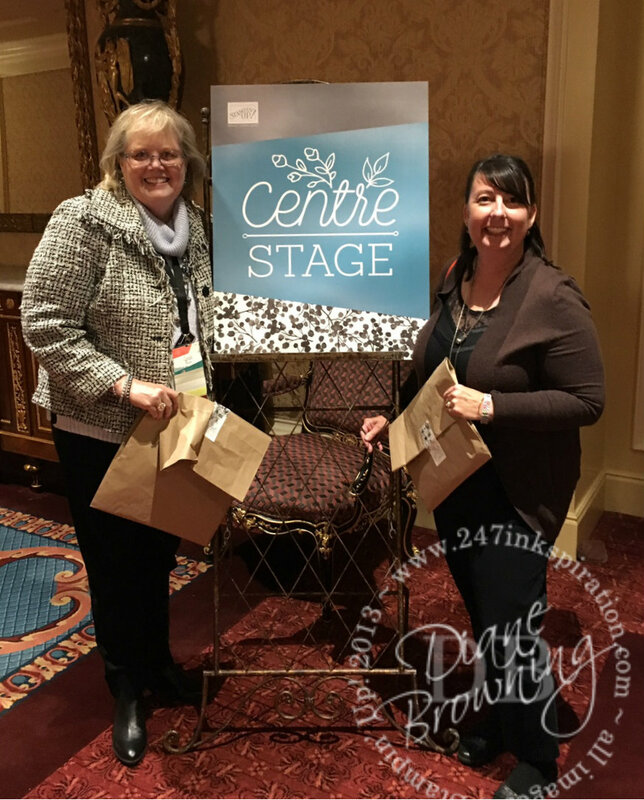 This year I qualified to attend our CentreStage Dinner. This is a beautiful dinner held for Silver Elites and above. 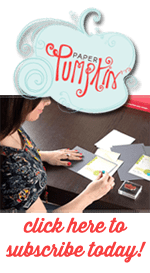 Stampin Up really does reward our hard work. It was an amazing dinner and the speaker was inspiring as well. 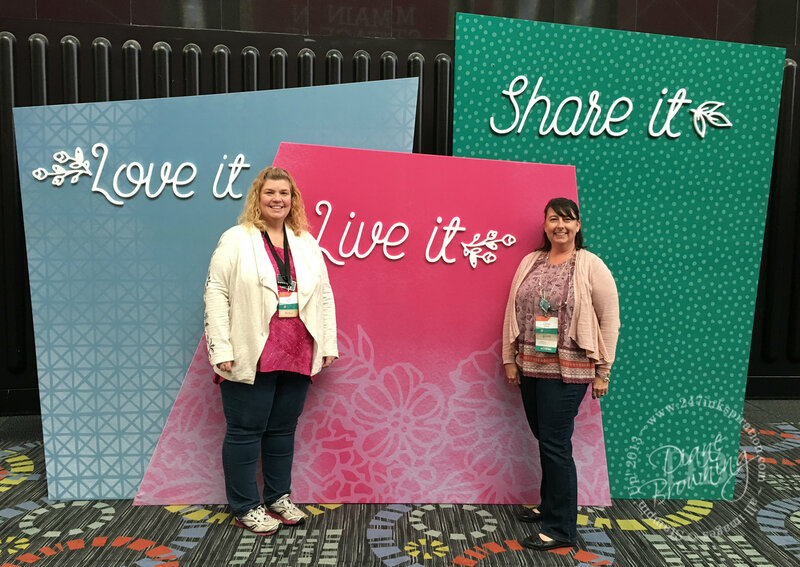 It was so great to meet up with my friend Lynda that I had met years ago at a Stampin Up Event in Orlando. 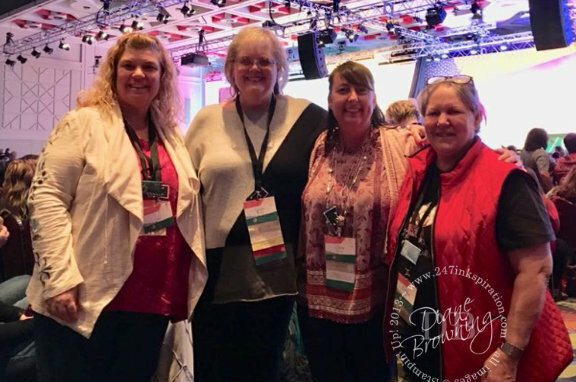 It is so great getting to spend time with friends from around the Country. 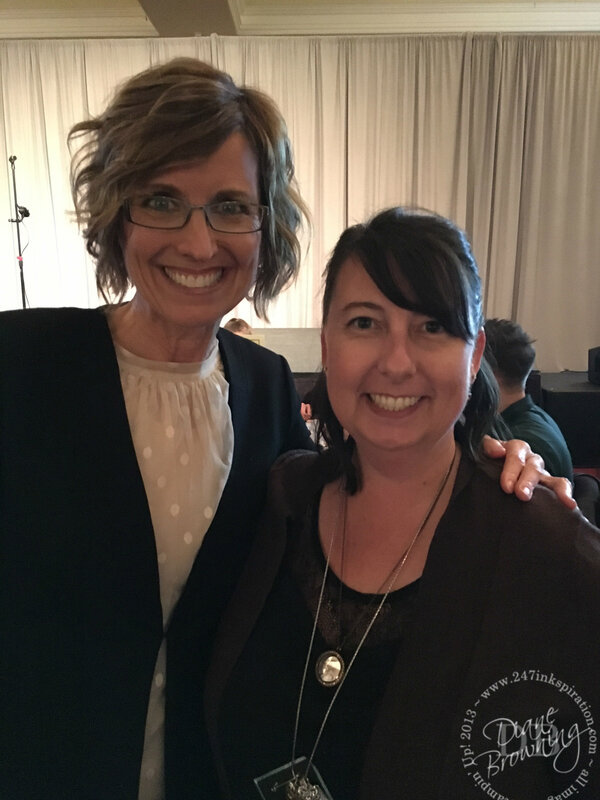 At dinner, I also got a chance to talk briefly with Shelli Gardner, Stampin Up’s Founder. She is so very sweet and kind. This convention was pretty amazing. 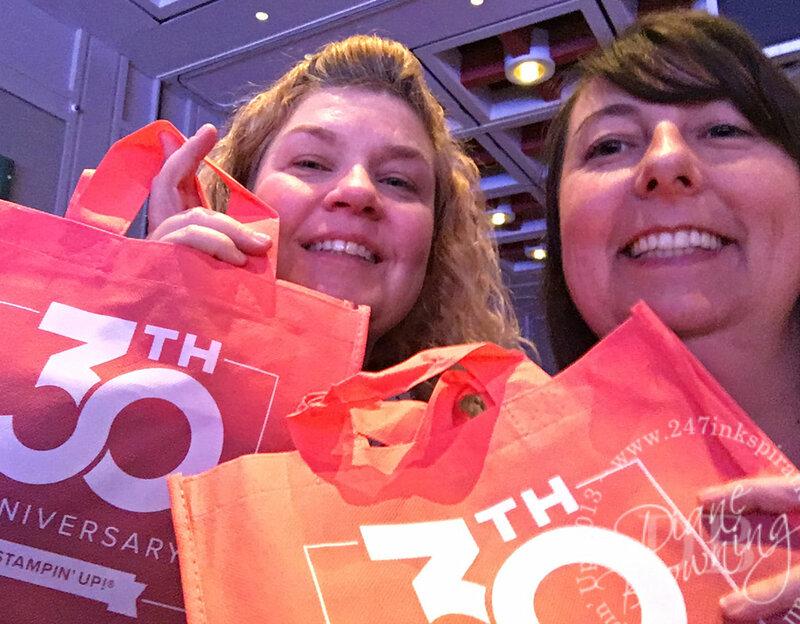 There were a number of giveaways and both Lyndi and I won a Prize Patrol. Lyndi says that I always win Prize Patrol so she was pretty excited to have the same color badge as me. She was pretty sure that meant she was going to win as well. More giveaways?!? They really spoiled us this year. 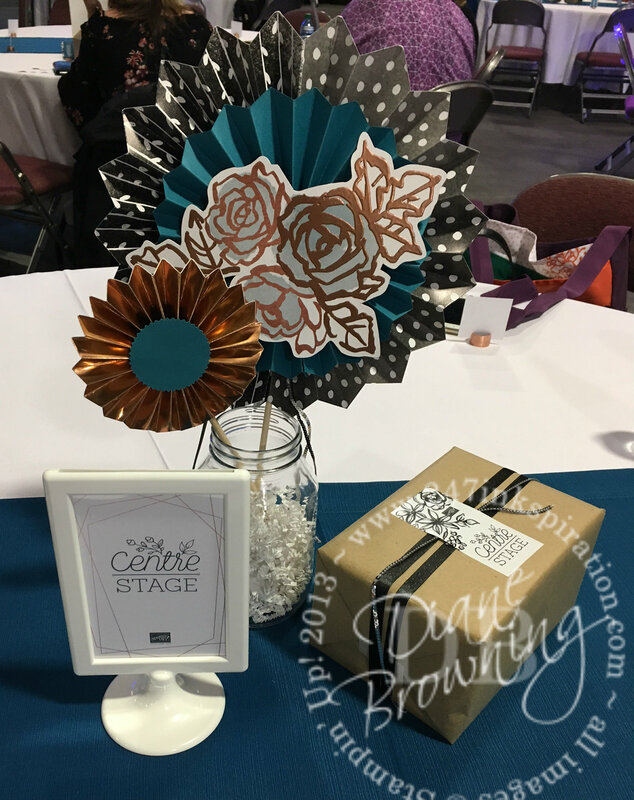 On Saturday, Stampin Up hosted CentreStage Lunch for those of us that are Silver Elite and above. This one was a little more business focused, but just as entertaining. Guess what’s in that package on the table? Free stamp sets for all of us! Like I said, Stampin Up really does appreciate all of our hard work. Here is a picture of all the goodies I’m came home with. I can’t believe how much they spoil us. So we all go home a little tired, but recharged with tons of new ideas to try. Really, the best part of these events is meeting up with friends and making new friends too. Doesn’t this sound like fun? Well, then you should go with me to the next OnStage Event. It will be in April 2018 in Las Vegas. All you need to do is join my team and you can go with me. 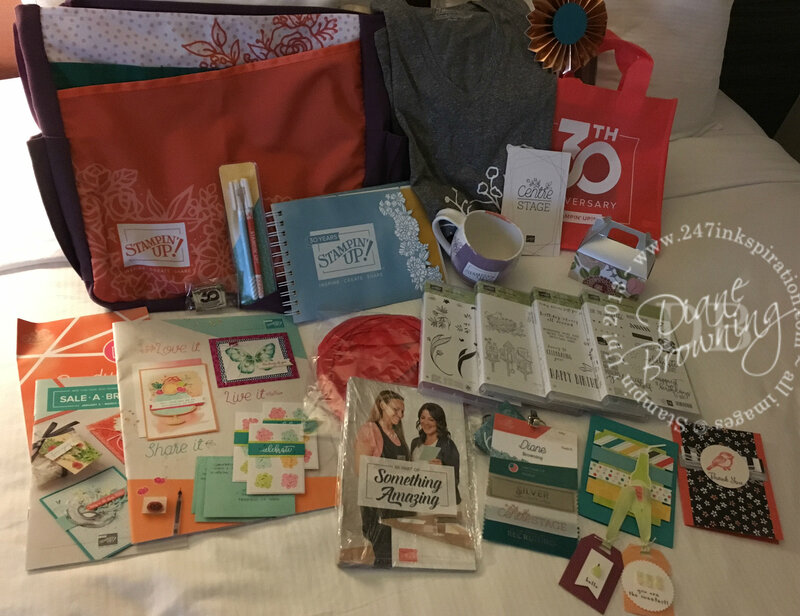 I have an incredible group of ladies on my team and we are always looking to make new crafty friends. Contact me with any questions you have. 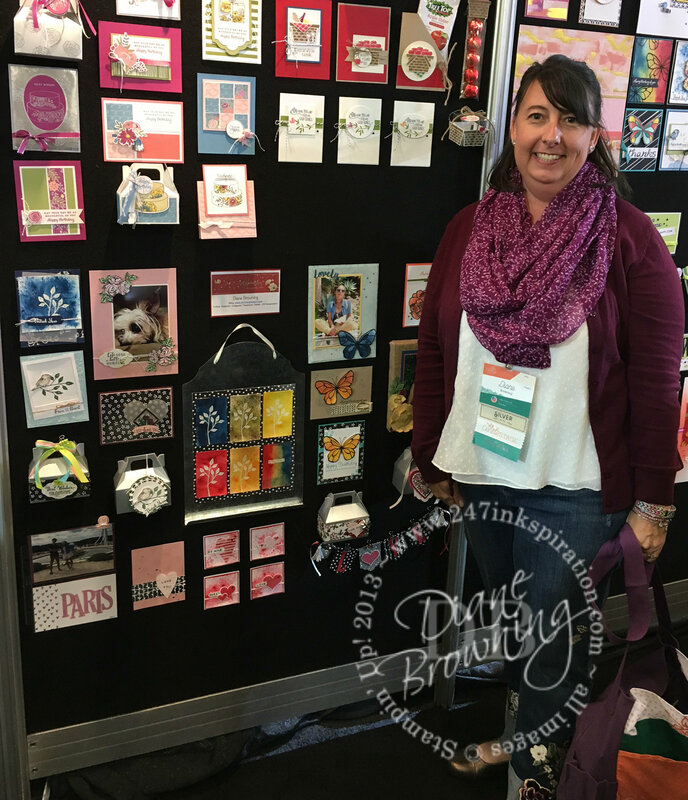 I just have to share… one last picture of me with my Display Board. Did you hear about the end of year sale? Items on the retirement/clearance list are while supplies last ONLY. Don’t wait if there is something you really wanted to get.